Making a flower garden can add value and the livability of your home. There is nothing that can brighten your home like a flower garden. The best thing about flower gardens is the fact that it is not as hard as it seems to be. You just need to have the right dedication and to have the right attitude in making things better. Step 1. Choosing the perfect spot is crucial. You need to think about certain things to make the flower garden work for you. The first thing that you need to consider is the amount of sunlight that is going into the garden. If you are starting a flower garden in a cramped space such as a high-rise urban residence, you need to position the area of the garden in such way that it is able to be reached by the sunlight effectively. Sunlight is important for the growth and development of plants. It is best to place the plants to get ample sunlight at least six hours a day. If you have ample space, check the soil condition. You may need to check whether the area has a rocky soil. If you have a big space allotted for your flower garden such as a big backyard, try to avoid big plants like trees. The trees may compete for the nutrients and get it away from the plants. Step 2. Designing the area of the garden is a must! Never design a garden that is too big for you to keep. Sometimes people end up frustrated and would no longer tend their garden because it is too big for them and the time is not enough to give ample coverage. Smaller gardens are logically easy to tend and cheaper. Expansion should be done slowly and you need to take into consideration if you are able to tend the bigger garden with your limited gardening time. Try to start with a 30-square-foot garden that can accommodate at least 30 plants. Step 3. Choosing the color motif or theme. Such choice will help you bring liveliness into your garden space. Colorful plants are a great way to brighten the area and bring about the initial idea of making a garden in the first place. 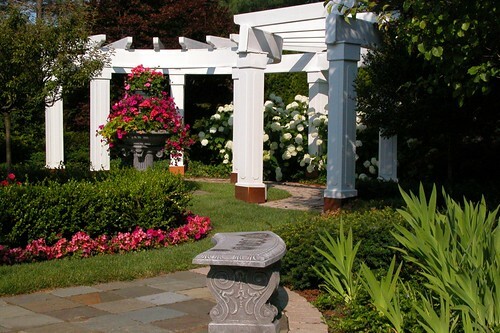 It would be best to have a monochromatic or analogous color scheme in your garden. The monochromatic color schemes use the shade of the same color. Contrasting colors are also great. It can be achieved through the use of opposing colors such as blue and orange, red and green or yellow and purple. Step 4. You need to decide when the garden should bloom. People like it when the garden splendidly blooms during its bloom season. If this is something that you would like to try then you need to start the garden during the spring so that the garden will bloom during the summer or during the middle of summer. Choosing the plants that will bloom during the season that you want them to blossom is also crucial. Try to plant some annuals with perennials to fill the gaps in between the blocks. Having a great garden will add a lot of color and joy to your home. You need to maintain the flower garden and to put a lot of effort to keep it alive. You need to have lots of dedication and commitment to make the garden blossom.